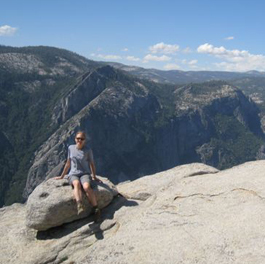 It was a huge relief to Carol Thompson in 2011 when her breast cancer drug Femara (letrozole) went off patent and became available in a generic version. With a high deductible in her private insurance plan, Thompson was forking over $450 for a month’s supply of the life-saving drug. After the generic hit the market she was thrilled to find letrozole available for just $11 a month at Costco. But curious to find out if she could save even more at another pharmacy, Thompson made a few calls to local chains and mail-order services to compare prices. What she found was astonishing: prices for letrozole ranged wildly, from $450 for a month’s supply at CVS to just $14 at a local, independent drug store. Pity the person who assumes that big national chains like CVS and Target that buy generics wholesale in large quantities will naturally provide the best value. Thompson’s story is told in a recent PBS NewsHour segment that takes a wider look at the wildly different prices pharmacies charge for medications that include some of the most common prescriptions drugs. What 66-year-old Carol Thompson encountered in Edina, Minnesota should be an eye-opener for any of us who assume the price we pay for generic drugs is more or less the same from pharmacy to pharmacy. 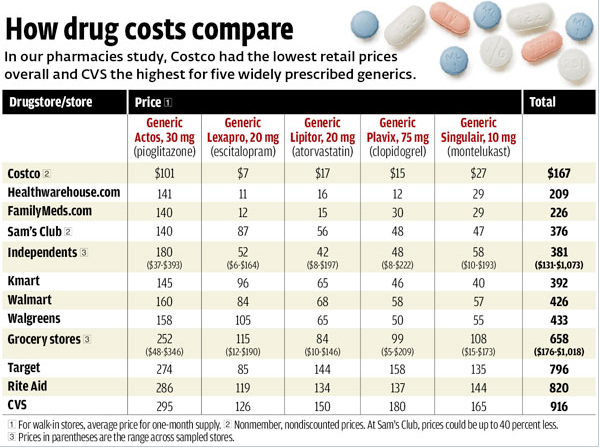 The explanations from chains like CVS for why some of their generic drugs cost so much is that the price reflects the added cost of having 24 hour prescriptions services, drive-through pharmacies and so many local brick and mortar stores. But this explanation rings false: For prescription drug buyers it is just the latest case of haggling for health care. The problem, once again, is that most consumers are not or should not have to be as savvy as Thompson. Generic drugs play a central role in reining in health care spending. Nowadays, these copycat versions of off-patent drugs account for 84 percent of all prescriptions filled in the U.S. According to healthcare analyst IMS Health, the market dominance of generics has saved the U.S. health care system more than one trillion dollars over the last decade. In 2012 alone, patent expirations of name-brand drugs like the blood thinner Plavix and the asthma drug Singulair led to a record reduction of $28.9 billion in spending on medicine. Not only do consumers have to aggressively comparison shop, but they also have to read supermarket circulars. In March, the Philadelphia Inquirer reported that Wegmans, a supermarket chain, was offering free atorvastatin for customers with prescriptions until the end of 2013. ShopRite stores in the Philadelphia region offer seven diabetic drugs free with a prescription as well as antibiotics. The chains are using the free medications to lure more customers to their stores, hoping that they will become frequent visitors and buy other medications and weekly groceries. A recent op-ed in the New York Times by Elisabeth Rosenthal cites a website called GoodRx.com that was founded by Facebook and Yahoo veterans and provides information on drug pricing in a user’s area, along with coupons for deep discounts. “A few minutes on the site shows what [GoodRx.com’s] Mr. Hirsch calls ‘extraordinary price variations’: drugs that sell for $150 a month at one pharmacy are given away to members of a loyalty program at another,” writes Rosenthal. All this bargain hunting and price inconsistency may sit well with conservatives who see free-market competition in healthcare as the key to lowering spending. But without transparency there is no free market —only bargains for those with the means to research prices or those lucky enough to use a nearby pharmacy that offers lower prices on generic drugs. For the millions of other Americans—many uninsured or with large deductibles—who have never considered that prices on their generic medications could vary so dramatically, the so-called free market is a sham. I just tweeted your blog and am publishing a very short post on HealthBeat, quoting you, and linking to your post. Hope all is well! This post is really important. More and more people will be trying to find ways to keep cost down since the deductible on most insurance it going up — a lot. more information for your health. Great post! Always ask your doctors about generic options to save a great deal of money. Then do shop around since prices at pharmacies are fluid. Look for a pharmacy that give discounts. Thanks for sharing helpful information in making smart, safe choices for medicine shopping.